Be a rootin-tootin gun slinging cowboy on Halloween. Acrylic blend faux sheep skin vest and chaps trimmed with metal and leather. Fits most children size 10. Hat not included. If you son wants to look like a real cowboy, this costume fits the bill. Acrylic blend faux sheep skin vest and chaps trimmed with metal and leather. Fits most children size 8. Hat not included. 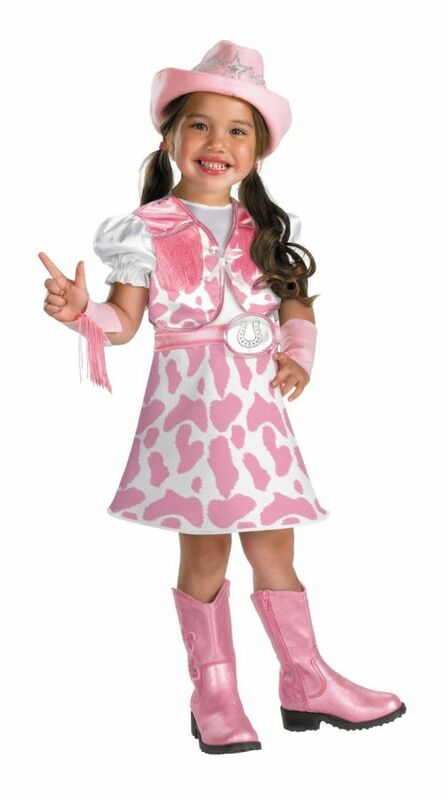 Your little cowgirl will look cute as a button in this costume. Dress with white top and pink cow-print skirt with attached vest, attached pink belt with silver buckle. Matching pink hat and detachable pink wrist cuffs with fringe also included. Fits child size 4-6. Your little cowgirl will look cute as a button in this costume. Dress with white top and pink cow-print skirt with attached vest, attached pink belt with silver buckle. Matching pink hat and detachable pink wrist cuffs with fringe also included. Fits child size 3T-4T. Your little cowgirl will look cute as a button in this costume. Dress with white top and pink cow-print skirt with attached vest, attached pink belt with silver buckle. Matching pink hat and detachable pink wrist cuffs with fringe also included. Fits child size 2T. Here is a cowgirl costume that embodies a wholesome American look. Acrylic blend faux sheep skin vest and skirt trimmed with leather, feathers, and metal buckles. Fits most children size 6. Hat not included. 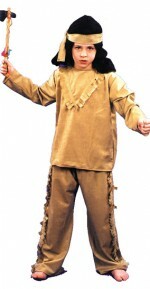 Look like an authentic little whipper snapper in this cowboy costume on Halloween! Acrylic blend faux sheep skin vest and chaps trimmed with metal and leather. Fits most children size 6. Hat not included. 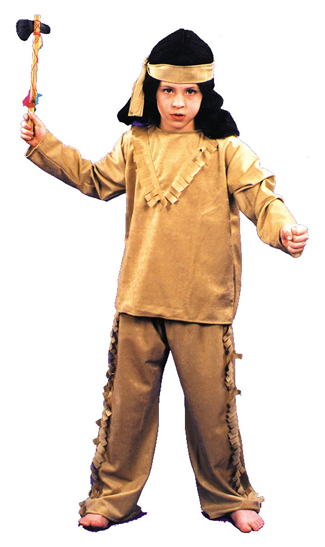 Go on the war path in this Indian costume on Halloween! Brushed polyester shirt, pants, belt and headband. Go on the warpath and take some scalps in the Indian costume. Jump right back in the saddle in the cowgirl costume on Halloween. Acrylic blend faux sheep skin vest and skirt trimmed with leather, feathers, and metal buckles. Fits most children size 8. Hat not included. Tend the horses and rustle up some cattle in this cowgirl getup. 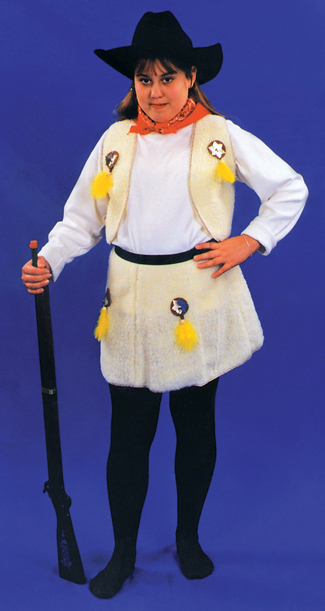 Acrylic blend faux sheep skin vest and skirt trimmed with leather, feathers, and metal buckles. Fits most children size 10. Hat not included. 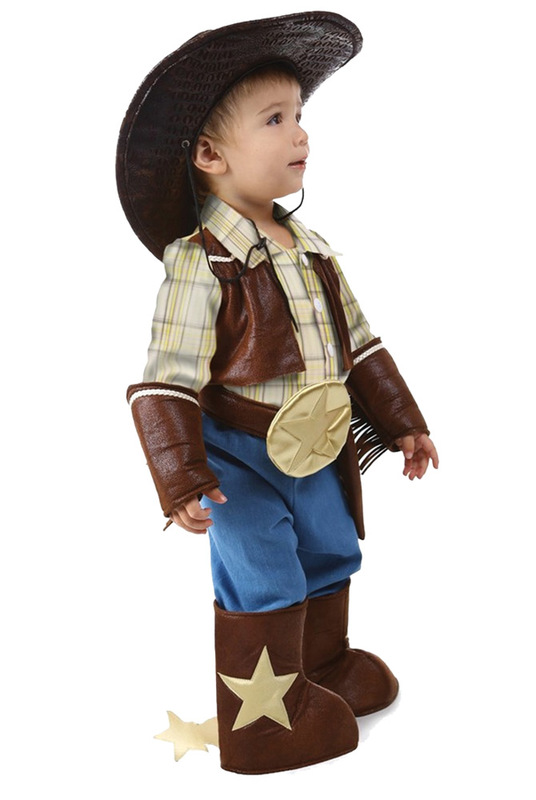 You will love this special cowboy costume for your little one! 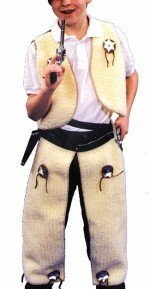 Velcro front shirt has an attached leather-look vest and fringed cuffs, and includes the pants with attached boot covers and cloth spurs, belt with big soft star trim, and leather-look hat. Fits toddler sizes 12-18 months.